Stems [caudiculi] scandent, 1m or longer, internodes 8 - 12 cm long. Cataphylls long, enveloping the internodes. 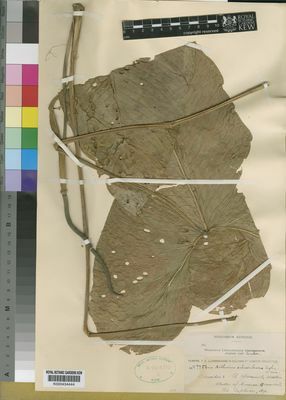 LEAVES: Petiole equal or longer than the blade, ca. 40 - 75 cm long, narrowly canaliculate above. Blade chartaceous, bluish-green, hastate, 30 - 70 cm long in total, 25 - 40 cm wide in the lower part, posterior lobes ca. three times shorter than anterior lobe, 12 - 20 cm long, 10 - 18 cm ("1 - 1.8 cm") wide, oblong, obtuse, separated by a large, semi-ovate sinus, diverging from one another, separated from the anterior lobe by an introrsely arcuate line, anterior lobe acuminate, 25 - 55 cm long, 15 - 30 cm wide; primary lateral veins 6 - 10 mm apart, very strongly differentiated, the numerous midrib veins and several of the basal veins and veins of the posterior lobes joined into a collective vein 2 mm distant from the margin, primary veins of the posterior lobes joined into patent, 2 - 4 cm long basal ribs long-denuded in the sinus. INFLORESCENCE: Peduncle 2 - 2.5 cm long. Spathe linear-lanceolate, long-acuminate, 13 cm long, 1 cm wide. Spadix up to 15 cm long, 4 mm thick, myosuroid [mouse tail-like]. Tepals scarcely 1.5 mm long and wide, green. Pistil 1.5 mm long. Ovary oblong ovoid, subconoid. Ecuador. Near El Yarumal, western slopes of Cuenca, Nanegal, and near San Domingo.